As of December 2005, all major food companies introduced the new nutrition label on their packaged foods. The main part of the new label is the Nutrition Facts Table, which gives you the following information: Calories and 13 nutrients: Fat, Saturated fat, Trans fat, Cholesterol, Sodium, Carbohydrate, Fibre, Sugars, Protein, Vitamin A, Vitamin C, Calcium and Iron. Five easy steps to help you read the label. Compare the serving size on the package to the amount that you eat. If you eat the serving size shown on the Nutrition Facts Table you will get the amount of calories and nutrients that are listed. Calories tell you how much energy you get from one serving of a packaged food. % Daily Value puts nutrients on a scale from 0% to 100%. This scale tells you if there is a little or a lot of a nutrient in one serving of a packaged food. Use this percentage to compare the nutrient content of different foods. Step 1: Serving size: The information on both packages refers to one burger. Step 2: Calories: Each beef burger has 340 calories, each chicken burger had 200 calories. 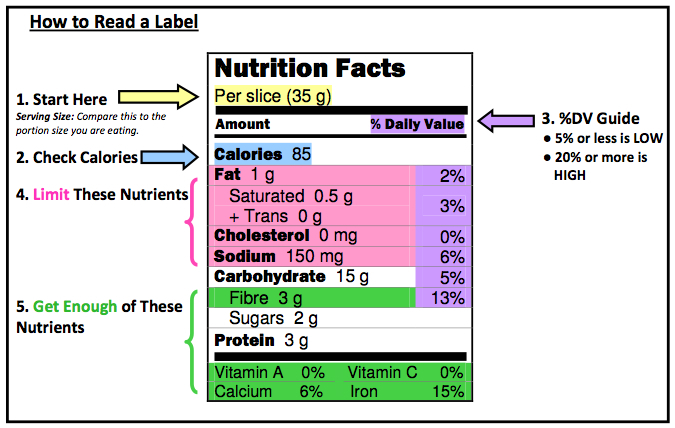 Step 3: Look at the % Daily Value: Scan the numbers, and compare which burger is higher or lower in a particular nutrient. Step 4: Nutrients you want more of: At 30%, the beef burger contains a lot of iron. Step 5: Nutrients you want less of: The fat and saturated fat content are higher in the beef burger. However, the chicken burger has more than double the amount of sodium as the beef burger. Bottom Line: If you’re looking for an iron-rich food, the beef burger is your best bet. However, if you’re looking for a lower fat option (but much higher in sodium), then the chicken burger is the one to choose. Nutrition claims provide a snapshot about the amount of one specific nutrient in a food, such as fibre or fat. While nutrition claims are optional, they must meet government regulations before appearing on a package. "Source of fibre" means the food contains at least 2 grams of fibre in the amount of food specified in the Nutrition Facts table. "High source of fibre" means at least 4 grams of fibre, and "Very high source of fibre" is at least 6 grams of fibre. "Low fat" means that the food contains no more than 3 grams of fat in the amount of food specified in the Nutrition Facts table. The claim "Cholesterol-free" means that the product has a very small amount (less than 2 mg of cholesterol in the amount of food specified in the Nutrition Facts table) and it is also low in saturated fat and trans fat. A "sodium-free" claim means the amount of food specified in the Nutrition Facts table contains less than 5 mg of sodium. The term "light" is allowed only on foods that are either "reduced in fat" or "reduced in energy" (Calories). "Light" can also be used to describe sensory characteristics of a food, for example light tasting or light coloured.